I was hurrying like crazy yesterday trying to get my 4 card samples complete for my potential class in March and make a card for this challenge before we head to Phoenix to see George Strait! Hubby and kids bought me a ticket to his The Cowboy Rides Away tour and the tickets weren't cheap in any sense of the word. So, hustle hustle all yesterday afternoon. But I will only be showing my Valentine for the Red Rubber Inspirationals challenge at this time. My inspiration was found on Pinterest but the only info I could find was a watermark of "Lin 2012". No website or blog so I cannot give anyone any credit for this cool card. I used a stamp set called "I Heart You" which has some great hearts and phrases. I had the pattern paper scrap left over from something last year and had just enough to make the base, heart strip, and little hearts. I like the red and kraft colors! I used some solid twine from The Twinery and Momento ink. Turned out pretty good, I think. What's your opinion? Head on over to Red Rubber Inspirationals and check out the cool cards that are done by the designers and the challenge cards. Such a beautiful card design, I love it!! 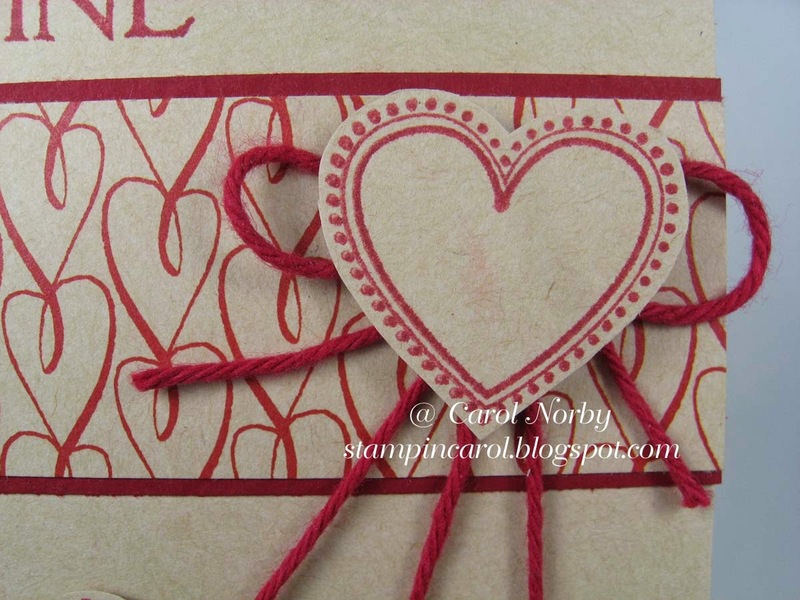 Great use of the stamped hearts! Thanks so much for joining us! Carol, Swingin' simply swingin' Val card. You go girl! Red on white is so classy. CAS wins again!! Triple heart design really steals the eye gazing second glance. Well done. from the land of closed college campuses where natural gas and propane are in a ration diverted to hospitals and institutional needs. Blessings on you in heated desert cool nights. That's a nice card, simple and classy. I love your heart card, Carol. Thanks for joining the challenge at Red Rubber Inspirational. I really like the red and kraft! It's a striking combination. Love how you did the card, too. Very nice - and have fun at the concert - love George Strait. 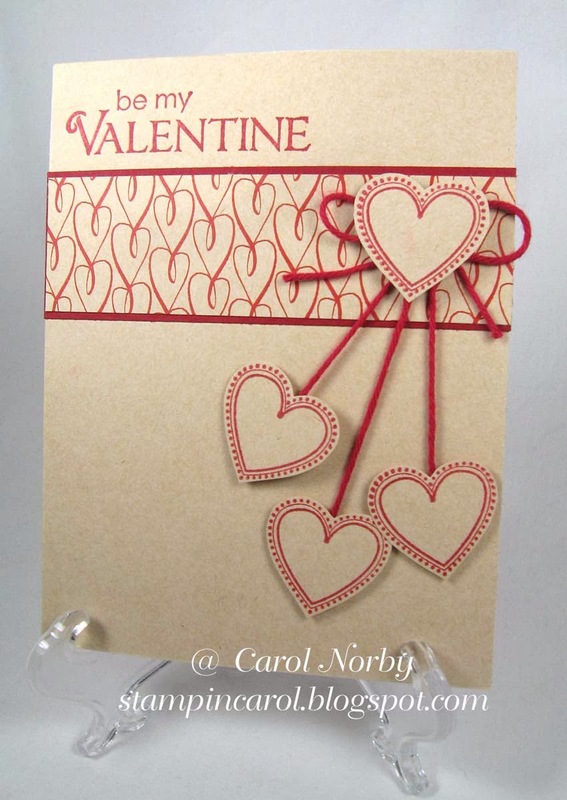 That patterned paper goes great with the heart stamped images, nice card. What a great card! !I love all of the hearts and the combo of red and kraft! !Thanks for joining us at Red Rubber Inspirationals! Don't you just love when you have a scrap that can make a card just right and this card IS just right. Loving the little dangling hearts. Fabulous card! I love the dimension you got on it! Thank you for joining us at the Red Rubber Inspirationals!